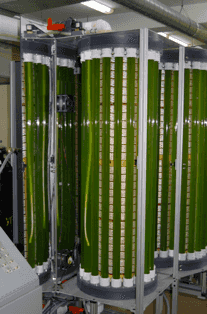 Algae Grow Lab developed a series of tubular and flat photobioreactors for algae cultivation as well as a process of cell ultrasonic destruction based on Hielscher ultrasonic processors equipped with flow cells. The general flow diagram of the process is shown below. 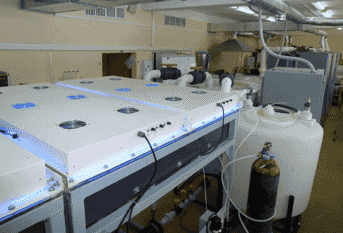 Examples of Algae Grow Lab photobioreactors are presented below. The use of the LED panels emitting light in the PAR part of spectrum allows to achieve a maximum grow rate of algae. For example, after inoculation of Chlorella Vulgaris with the initial density of 0.146 g/L we achieved the density of 7.3g/L in 7 days. 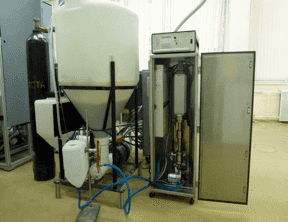 Algae Grow Lab supplies photo-bioreactors and equipment for alge oil production. After the algae growth stadium, the algae cell are ripe for the oil production treatment. As the cell content is separated from the surrounding environment by a structure of comprised cell membranes, the cell disruption method is significant regarding the release of the complete intracellular material. The cell membrane provides mechanical strength to the cell and preserve its integrity. The elastic properties of the cell membrane allow the cells to withstand the rapid changes in osmotic pressure that may occur in their external surroundings. Both ultrasound and microwave-assisted methods, which are described below, improve the extraction of microalgae significantly, with higher efficiency, reduced extraction times and increased yields, as well as low to moderate costs and negligible added toxicity. 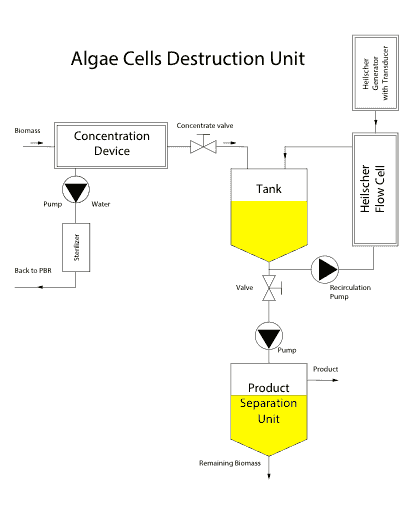 Very often the extraction of the goal products from algae is more effective if the algae cells are destroyed prior to extraction. But sometimes, the cell destruction itself leads to release of the goal product, and only the separation process is needed to get it (e.g. the extraction of lipids from algae for biofuel production). 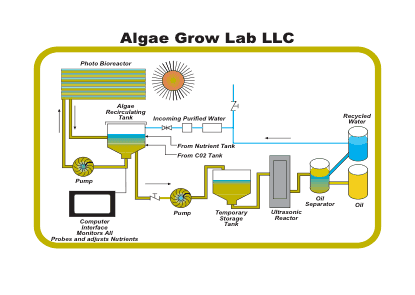 Algae grow lab integrates an ultrasonic system for cell disruption and extraction into their setup to ensure an highly efficient process achieving a complete release of intracellular content and thereby higher yields in shorter time. In the ultrasonic reactor, ultrasonic waves create caviatation in the liquid media which contains the algae cells. 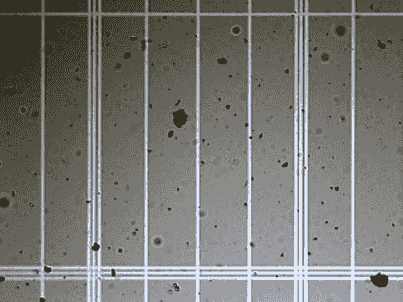 The cavitation bubbles grow during the alternating rarefaction phases of the ultrasonic wave until they attain certain size, when no further energy can be adsorbed. At this maximum point of bubble growth, the voids collapse during a compression phase. The bubble collapse creates extreme conditions of differentials of pressure and temperature as well as shock waves and strong liquid jets. These extreme forces do not only destroy the cells, but also effectively wash out their contents into the liquid media (e.g. water or solvents). The effectiveness of the ultrasonic destruction strongly depends on durability and elasticity of the cell walls, which varies considerably between the individual algae strains. That is the reason why the efficieny of cell destruction is highly influenced by the parameters of the sonification process: The most important parameters are amplitude, pressure, concentration & viscosity, and temperature. These parameters must be optimized for every particular strain of algae to ensure the optimal processing efficiency. Dunnaliella salina and Nannochloropsis oculata: King P.M., Nowotarski K.; Joyce, E.M.; Mason, T.J. (2012): Ultrasonic disruption of algae cells. AIP Conference Proceedings; 5/24/2012, Vol. 1433 Issue 1, p. 237. Nannochloropsis oculata: Jonathan R. McMillan, Ian A. Watson, Mehmood Ali, Weaam Jaafar (2013): Evaluation and comparison of algal cell disruption methods: Microwave, waterbath, blender, ultrasonic and laser treatment. Applied Energy, March 2013, Vol. 103, Pages 128–134. Nanochloropsis salina: Sebastian Schwede, Alexandra Kowalczyk, Mandy Gerber, Roland Span (2011): Influence of different cell disruption techniques on mono digestion of algal biomass. World Renewable Energy Congress 2011, Bioenergy Technologies, 8-12 May 2011, Sweden. Schizochytrium limacinum and Chlamydomonas reinhardtii: Jose Gerde, Mellissa Montalbo-Lomboy M, Linxing Yao, David Grewell, Tong Wang (2012): Evaluation of microalgae cell disruption by ultrasonic treatment. Bioresource Technology 2012, Vol. 125, pp.175-81. Crypthecodinium cohnii: Paula Mercer and Roberto E. Armenta (2011): Developments in oil extraction from microalgae. Europeen Jornal of Lipid Science Technology, 2011. Scotiellopsis terrestris: S. Starke, Dr. N. Hempel, L. Dombrowski, Prof. Dr. O. Pulz: Improvement of cell disruption for Scotiellopsis terrestris by means of ultrasound and a pectin decomposed enzyme. Naturstoffchemie. After cultivation, the algae biomass stream is fed to the concentration device to separate the biomass from the liquid media. The concentrate is accumulated in the storage tank. 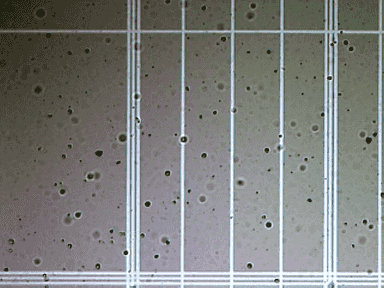 After the separation, the cells must be disrupted to release the oil and other intracellular material. Therefore, the concentrated biomass is pumped through a Hielscher ultrasonic device. The ultrasonic recirculation setup ensures the recirculation of the cell concentrate under the given pressure through the Hielscher flow cell back to the accumulation tank. The recirculation lasts the time required to destroy cells. When the destruction process is completed, the biomass with the destroyed cells is pumping to the product separation device, where the final separation of product from the remaining debris occurs. The first analysis method is based on the measurement of the chlorophyll A, B, and A+B fluorescence. During slow spin centrifugation, algal cells and debris will pellet at the bottom of the recipient, but rests of free floating chlorophyll will still remain in the supernatant. Using these physical characteristics of the cell and chlorophyll, the percentage of the broken cells can be ascertained. This is accomplished by measuring firstly the total chlorophyll fluorescence of a sample. Then, the sample is centrifuged. Afterwards, the chlorophyll fluorescence of the supernatant is measured. By taking the percentage of chlorophyll fluorescence in the supernatant to the chlorophyll fluorescence of the total sample, an estimation to the percentage of broken cells can be made. This form of measurement is fairly accurate, but makes the assumption that the number of chlorophyll per cell is uniform. Total chlorophyll extractions were performed using methanol. Firstly, the cell density of the harvested algae sample before the ultrasound treatment is measured. 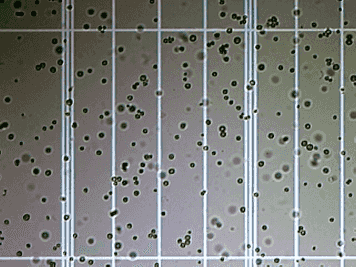 Secondly, the number of non-destroyed (remaining) cells after sonification of the same sample is measured. Based on the results of these two measurements, the percentage of destroyed cells is calculated.